Well the time has FINALLY come for me to show you what project is up next on the list. After a long three months, I have finally finished what I’ve been planning on finishing for it seems like a decade. Well no need to make you wait any longer. The last room in the house has been painted!!! Yep, you’re right, Brandy’s room got some loving the few days and I am in love with the color!! If you remember, I was trying to decide between three colors here and this post. And here’s the color I chose! Beautiful isn’t she! I know the picture doesn’t really tell you what color I chose, just wanted to show off this beauty for a second. The winner on these beautiful walls is Whale Watching by Valspar. Since this is a small room I decided to go with an satin finish so that the light can bounce off the walls and boy did it pay off! The room looks a lot bigger than when there was that bright yellow on all the walls. Speaking of yellow let’s take a flash back to how this room looked a few days ago. I thought I had another picture that I could show you but for some reason it’s in my lost files somewhere. Hopefully this picture does enough justice for you. Let’s continue to these after photos! All I know is that I’m in love with this color. I am overly excited every time I look at the walls, but the walls are just one step in the right direction for this room. Here’s the rest of the plans for Brandy’s room. I plan on getting rid of the desk lamp and either taking one of my old lamps and painting it or getting something like the lamp in the picture. On the TV wall I plan on mounting the TV and putting a floating shelf underneath it. 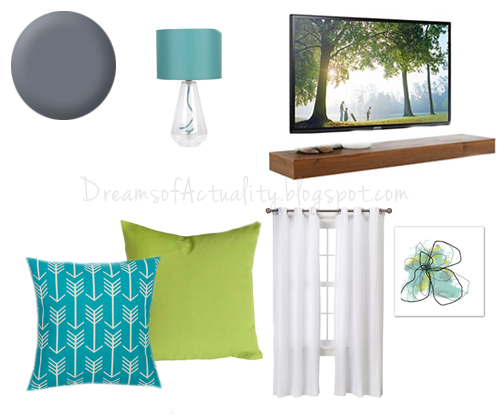 Teal and green are going to be the accent colors throughout the room with white curtains. I still have a million of ideas going through my head at the moment but I’m still sorting through them. Of course this room probably won’t be finished until the end of the year or so since Caiden will most likely take away most of my time when he comes in March! The only big thing that needs to be done in this room is some closet organization and a new light fixture since only the fan is working. I’m excited to see where this is going and I’ll try not to stay away for too long next time! Love love love that color banana and the room plan! Thanks Quayla! I'm excited to get everything going!